This was Van Gaal’s first season out of 2 in charge of Bayern – who were previously managed by Jurgen Klinsmann – as he provided the base for the successful possession game of the coaches who came after him (Jupp Heynckes from 2011-2013 and Pep Guardiola from 2013-2016). In this European final Bayern’s positional possession game simply wasn’t good enough against Inter’s defending and quick counterattack combinations. Looking at Bayern in possession would likely remind many Manchester United fans of how their club is playing today. They have a clear structural guideline in possession and don’t deviate from it very much. Bayern played in a 4-2-3-1 structure while in possession and didn’t have many structural adjustments throughout the match. 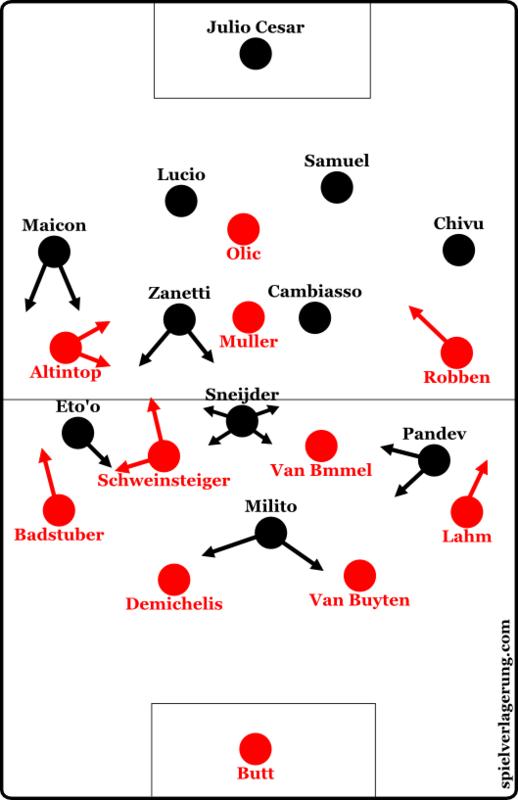 Most often what would occur is that both Schweinsteiger and Van Bommel remained stationary in the center (with Bastian occasionally moving higher in the left halfspace) while the fullbacks both moved higher and the wingers remained wide as well. Olic acted as the lone striker occupying the defensive line and using his seemingly limitless energy to make runs towards either flank to help the team gain space up the field before playing it back. Muller played deeper than him in the #10 space and occasionally made movements which were similar to Olic in that he attempted to provide an outlet for his team (mainly in transition) towards either flank. Though for the most part everyone stayed in their positions and the team tried to circulate the ball from one side to the other very quickly to attempt a breakthrough. The big problem here was that Bayern lacked any sort of structural dynamics, speed, or group combination play to penetrate the pressure. The infamous “U”” shape which Guardiola told his team they must avoid was in full view for Bayern in this match up. They weren’t able to break through the Inter defense and move directly towards vacated space, but were most often forced back and towards the other side through their defensive line. The Bavarians brightest form of attack was simply Arjen Robben using his dynamic dribbling ability in isolation to attempt to create chances. He would either have to dribble 1 or 2 players and break into the box for a cutback cross, or he would cut across the face of goal and attempt long diagonal shots (and sometimes passes) towards the far post. This stagnant approach to positional possession which left the players isolated had adverse effect on the defensive transition of the Bavarians. They lacked the proper compact structure and occupation of central areas at the moment of the ball loss to control the offensive transitions of Inter with counterpressing. Because they lacked proper control in transition and had their fullbacks push forward, they were exploited down the flanks in transition. Because they struggled to penetrate the defense, Bayern most often lost the ball (if it wasnt a long shot or a long ball) in midfield areas and this led to dangerous counterattacks by Inter Milan. Milito was an excellent outlet in transition as he shielded the ball and combined with his teammates properly – and most importantly he had very intelligent and powerful running which was difficult to defend. A bright spot in Bayern possession game was a structural progression which involved Badstuber pushing high up the wing and Schweinsteiger dropping deep into the halfspace in the defensive line. When Badstuber pushed up the field Altintop would move inside toward the halfspace – and this structural shift helped distort the Inter Milan defensive shape (even though Bayern got into their own way when it came to exploiting this distortion). Robben would also move towards the center of the field at times as Lahm would occupy the wing, but ultimately he was isolated from his teammates due to the rigid positional structure and could penetrate the defensive properly – which inevitably led to long shots (which he had scored many of in that Champions League campaign). A common characteristic of all of Jose Mourinho’s teams within his career is that they lacked midfield compactness. Porto, Chelsea, Inter, Real Madrid, Chelsea again – you name it! Obviously he has been able to get by successfully – especially early in his career – but I feel this is something which frequently causes problems for him. In his most recent struggles at Chelsea poor zonal occupation of the field has been one of biggest weak points (which we have analyzed here on SV), although this season’s Chelsea are even less compact than usual. He has always struggled against teams which can properly exploit these gaps in midfield to penetrate his defense (Guardiola comes to mind). In this European final it was no different. When Schweinsteiger would drop into the defensive halfspace as I mentioned earlier, Zanetti would leave his central midfield position to press a very far distance diagonally. This movement in itself is not so bad – it can actually be very stable in many systems (as Dortmund used something similar against Real Madrid in the past). Though when Zanetti made this movement, instead of covering for him his teammates would man-mark the other Bayern players on the field. This resulted in a lack of compactness which opened large gaps as the team wouldnt shift collectively towards the ball to support Zanetti and pressurize the area. Eto’o would follow Badstuber deep and Maicon would track Altintop as he dropped into the halfspace. Though this progression seems promising, Bayern were unable to capitalize on Inter’s shape because Van Bommel and Muller (and the rest of the team) simply wouldnt move very much. The team lacked structural dynamics and movement to cause positional advantages and rotations from the defense. Once this progression occurred and Inter reacted – the Bayern players remained in their strict positional structure and didn’t combine through vertical passes and lay-offs, back heels, or 3rd man runs. It is a large group of players on the field with many connections who anticipate each other’s movements, move quickly, combine and change structures which is extremely hard to defend – NOT a team which remains in an organized positional structure and moves the ball from one side to other! Inter’s defense wasn’t forced to cope with a team which would exploit their uncoordinated midfield defensive structure and simply had to shift from side to side and defend isolated dribblers. The one time which Bayern had a dynamic combination between 3 players was when a vertical ball was played into Olic laid the ball off with a back heel towards Altintop running through the halfspace – Altintop then played the full-speed Muller (who started his run during the vertical pass) through the defense for a 1 on 1 situation vs. Julio Cesar which he failed to convert. This ability to combine and penetrate came later when Jupp Heynckes took over the team, and we all remember what he did in his last season at Bayern. In regards to offensive movements, it was Sneijder who was most present during the game. Meaning he was nearly always on the ball or involved in the group play in the vicinity of the ball. He frequently dropped toward either halfspace to receive the ball and use his pressure-resistance to maintain possession and help Inter re-circulate. He also frequently made runs down either flank when Milito wasnt making such movements to provide an outlet while Pandev moved inside from the left flank. For the small time that Inter actually play in offensive possessions and not offensive transitions – their structure mainly revolved around the right side. Sneijder dropped toward the right halfspace most often while Maicon would move either towards the halfspace or down the wing dependent on where Eto’o would move (in the earlier stages he stayed wider on the right and Maicon moved inside during combinations). Pandev would move inside towards the center in front of the defensive line with Milito while Chivu slightly pushed up and Cambiasso and Zanetti occupied central midfield and didn’t move from there too often (though Zanetti made some penetrating runs when involved in combinations on the right flank). The structure in offense was stable for the most part and Inter did very well to counterpress (especially with Cambiasso and Zanetti in the center) and force Bayern into inaccurate long passes in transition. Bayern pressed in a 4-4-2 shape for the short time they were without possession and struggled to contain Inter’s quick combinations or long passes.For the first goal Cesar simply played a high and long pass into Milito in front of the defense before he laid it off to Sneijder and then made a run into the gap in the defense which he created with his lay-off pass to shoot and score. The second goal came when Milito, Pandev, and Eto’o simply stayed higher up the pitch during a Bayern offensive transition. Bayern lost the ball in transition and Sneijder was able to play the ball forward into Eto’o who played Milito into a 1 on 1 situation in the left halfspace against Van Buyten and resulted in a goal. This was an interesting match to analyze as it shows that the same problems which both managers had 5-6 years ago are still apparent (and maybe more obvious than ever before) in today’s game. Van Gaal with his stagnant and strict positional possession game and Mourinho with his uncompact zonal occupation of the midfield. Inter Milan definitely did perform better in this match up though and were the deserved victors. The Special One won his second Champions League trophy (and perhaps gained even more belief in his methods – which may or may not be a good thing?) and left Inter Milan for Real Madrid by winning the first treble in Italian history – definitely not a bad way to go out! Love these articles. Extremely interesting seeing the specific tactics of past champions. I hope you do one or both of the CL Ancelotti Milan teams. I am interested in how they managed to stuff so many central midfielders into a successful side. Anyway, thanks again for these.